I don’t suppose I can invite guesses for where this is. Somerset has a fair amount of coastline, but not much of it is as built-up as this, so it could only be one of a handful of places. 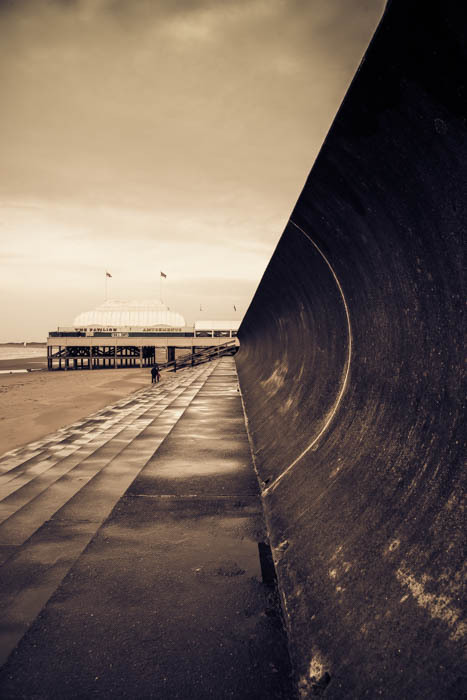 If the short pier doesn’t give it away, the great wave-like sea-wall surely must – it is the sea-front at Burnham-on-Sea. I took quite a few shots on the day and couldn’t resist making this great sculptural form a key feature in several of them. No doubt it has been specially designed by engineers to throw waves, high tides and storm surges back out onto themselves, but there is something powerfully aesthetically appealing about it too. It was taken in windswept, wintry circumstances, so I have made it more or less monochrome to capture that chilly feeling. Seaside it may be, but this was not bucket-and-spade weather. Onto other things: if I am talking about my photography week, it cannot go by without a mention for Adobe, with whom I have been in communication for most of the day. This morning, one of my key editing programmes – Adobe Lightroom – crashed disastrously. I switched it on, and just as I did so, some sort of update landed from Adobe, and with that, most of 14 years’ worth of photographs – 20-odd thousand of them – vanished from sight. You can imagine the panic. I had to deal with Adobe via a written chat thing that terminated in India. The first guy I got could not repair it. In fact the measures he took made matters worse: my files mostly reappeared – but with no photographs in them! Eventually he told me to restart the computer, knowing at that point I’d lose my link to him and he could escape. So I had to start again with another person, who, when s/he was unable to solve the problem, tried to blame me for losing the stuff! I must have deleted it all! All I’d done was switch the thing on. I’d never even seen before the part of the computer where Lightroom stored this stuff or the means by which it could be lost. In the end, I have most of my material back, but much of it is mangled. And from around 10 this morning to around 4 this afternoon is the time it has taken to get this far. It will take me scores of hours to trace all the missing photos – they’re in the computer somewhere – and put things back in order. Thanks a lot, Adobe.